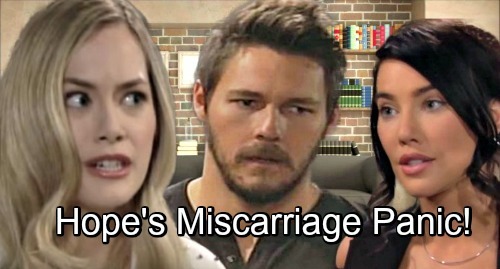 The Bold and the Beautiful (B&B) spoilers tease that Hope (Annika Noelle) will face a terrifying crisis. On next week’s new B&B episodes, September 3-7, she’ll worry about the fate of her unborn child. Whether she admits it or not, Hope’s got a lot riding on this little one. Liam (Scott Clifton) was ready to marry Steffy (Jacqueline MacInnes Wood) until Hope declared she was pregnant. That set “Steam’s” destruction in motion and paved the way for Liam’s recent wedding to Hope. Without that extra kid, Liam would be happy with Steffy and Kelly right now. Since the baby was such a crucial part of the “Lope” package, the idea of losing him or her should fill Hope with dread. Of course, she’ll concerned for other reasons first and foremost. Hope has suffered a miscarriage before, so she knows how much pain it can bring. She’ll hate the thought of going through that again. Hope will also hate to think about this baby never getting a chance to grow up. Still, no one could blame Hope for being worried about her marriage. She may fear that she’ll lose the baby and eventually, Liam. That double blow would really break Hope. She’ll understand that, so her growing concerns could bring some surprises. The Bold and the Beautiful tends to highlight how good and pure Hope is. Liam sees Hope as this perfect beacon who’s always shining through for him. He can count on her to do the right thing and never let him down. Brooke (Katherine Kelly Lang) often echoes Liam’s sentiments. Ever since Steffy cheated, Brooke has argued that Hope would never do anything like that. She always acts like Steffy’s the terrible one and Hope’s the honest upgrade. B&B may be putting Hope on a pedestal for a reason. They could be setting her up for a huge fall! People sometime do desperate things when they’re backed into a corner, so it may be time for Hope to get sneaky. If Hope has a miscarriage, could she hide the truth from Liam? Hope might continue to fake her pregnancy until she can figure out what to do. She might decide to get pregnant again ASAP and spring the truth on Liam once another bun’s in the oven. If Hope wasn’t trapping Liam before, she’d certainly be doing it this time – or at least she’d be trying to! Liam would likely find out and blow his top, so Hope’s efforts could cost her everything. In other words, trying to save her marriage could actually destroy it. Do you think the baby storyline’s headed in that direction? The Bold and the Beautiful spoilers say some shockers are brewing, so stay tuned. We’ll give you updates as other B&B news comes in. Stick with the CBS soap and don’t forget to check CDL often for the latest Bold and the Beautiful spoilers, updates and news.